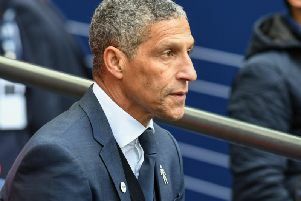 Brighton chief executive Paul Barber says the club would love to host a senior England international if the opportunity arose. Fans across the country fell back in love with the national team this summer after England reached the World Cup semi-finals in Russia. One of England's warm-up games before the tournament took place at Leeds' Elland Road ground and England meet Switzerland in a friendly at Leicester's King Power Stadium in September. Albion have already hosted England's under-21 team and a England women's match at the Amex. Asked about England's senior men's team running out at the club's home stadium, Barber told the Brighton & Hove Independent: "I'd love that. "The criteria for qualifying matches is usually you need a slightly bigger stadium than this but for friendly matches we would love to host a senior England game. "We've had the women's team here, we've had the under-21s here and we've had the Rugby World Cup here. "We think this is a wonderful stadium in a great part of the country, it's very accessible and with a great city to support us in terms of hosting people here. "It would certainly be one of our ambitions to host a senior England game if the opportunity comes up."